Wow it's been a long time since I've blogged. I'm back and hope to blog again at least weekly! Last year was a challenge to say the least. Had surg 3-19-2014 and had complications from it. Wound up not eating for 5 weeks, had nausea 24/7 and threw up anything that I at or drank. I was referred to a different SURG who diagnosed me with bile reflux. I take 3 meds daily and most symptoms are gone. When the dr did my last endoscopy he saw bile backing up from my stomach and recommended gastric bypass. I'm not excited about that and I'm trying to get a second opinon before I agree to have it done. I lost a lot of muscle mass and had to do physical therapy to get my strength back. Over the past 3 months I've been getting better. I started walking with a friend and we are up to 4 miles at a time. It takes me 20 minutes to walk a mile now. I'm so excited. My friends were really worried about me. I'm back to talking and skyping with my crafting buddies. While I was sick I couldnt get on the computer because I was so sick. It feels awesome to be crafting and physically active now. I'm going to post some pictures of what I've made lately. I couldn't figure out how to post pictures so I'll have to figure that out later. This week I would like to share a project I made for the Craftwell ebosser design team. I made a butterfly card using my eBosser machine and a Crafters Companion embossing folder. I used Teresa Collins paper as my base then layered with a lacy oval and used pop dots to add oval. Then I cut a doilies in half and layered that with a ticket punched square cut in half and topped with a button. The last step is to cut a butterfly (I used a Stampin Up die) and add german glass glitter by Melissa Francis. I had so much fun making this card. The design team project this week is a micro mini album. I made this by gluing the card stock to the designer paper. Then I added embellishments, ribbon closure, tabs, photo mats and journaling spots. Go to the Craftwell blog to check out all the new posts to the blog. The design team comes up with very creative projects. I used my eBosser machine to cut the photo mats and journaling spots. It's official I made the Craftwell USA eBosser design team. I was revealed on the blog today. Hop on over to http://blog.craftwellusa.com and check it out. Lots of awesome projects and meet the other girls on the design team. I am so excited to be apart of the Craftwell organization. My eBosser packs a big punch with die cutting and embossing. With the large cutting platform it makes cutting multiple dies a breeze. The cutting space is 8 1/2 x 11 inches. The machine rocks with embossing. You get a very deep emboss that is beautiful. I made a display card with my eBosser for a chunky charm I was giving away. I used a Spellbinders Label die to cut out vintage sheet music and chip board. Then I used a silver leafing pen around the edge and ribbon to tie the charms to the label shape. Hello everyone. Just wanted to post my first design team project for Tsunami Rose Designs. I made a mini wallet. Had a lot of fun making it and it has lots of tags and ephemera from the collection. The collection is called Parisian Daydream. I am submitting my Butterfly Garden Mini Album in Tsunami Rose Design blog. Keep your fingers crossed would love to win a prize. Wanted to share a junk journal I made. I used tags, envelopes, pockets, butterfly rub ons and a hodge podge of papers. I added notebook paper for journaling. It has over 100 pages of yumminess. I used burlap for page tabs. LOL I am submitting it for a Butterfly Challenge on Tsunami Rose Designs blog. Wish me luck! Can't believe it's been October since my last post. My goal for 2013 is to post weekly this year. I was just accepted on Tsunami Rose's design team. You can check out the blog and digital shop with the links at the top right on my blog. I'm really excited to start creating again since I stopped swapping. I have decided to sell my cricut expressions and Gypsy. My Gypsy has 43 Cartridges loaded on it. You will not receive actual cartridges only Gypsy. I am asked $230 shipped and take paypal. The Pink Cricut Expressions has hardly been used. If you wants to purchase make a comment below and leave your paypal info and I can send you an invoice. Please let me know if you have any questions. want to sell my Cricut Gypsy for $225 plus shipping. It has the following cartridges loaded on it. You will not get actual cartridges. Graphic 45 has a wonderful blog with awesome projects posted. A friend was looking at it and found this project. We had so much fun making it. Denise lives in New Jersey so we skyped and crafted. I used Tim Holtz hardware, embellishments, vintage images and Pink Paisley Butterfly Garden paper line. Just wanted to share what I received in the Free Spirit Cigar Box Swap. My partner was Lorretta Harwell. She was very generous with me. I received the cigar box filled with 3 Websters Pages pin flowers and a stamp. She also gave me a coordinating scrapbook set that matches the cigar box, I also received a 6x6 scrapbook layout and a wonderful mini album. Can't wait to use the things I received in upcoming projects. I am truly sorry to say I left out acknowledging my friends from Splitcoast Stampers as contributors to the project. I was giving albums from Diana, Joann, Carol, Danette and I hope I'm not leaving anyone out this time. I am so grateful you all participated in the project that is so dear to my heart. I plan to do another album project in the spring for Siteman patients. Please consider joining us making albums for the patients. I was playing around on You Tube and found a video on an Origami star box. My friend Kathy made one that I loved and I had to make one. It took about 5 minutes and is very easy to do. You need a bone folder to make the folds crisp and a square piece of paper. I used a 12x12 sheet of paper and it made a box with a 3 inch opening and 5 inch inside and bottom. Hope you try it. I am giving away Spellinders to one lucky winner. I am looking for followers.. When I reach 200 I will draw a random person. The only requirement is to leave a comment and follow my blog. Here are pictures of my work exhibited at the Des Lee Gallery Kaleidoscope of Hope showing. It was thrilling to have my work shown in a gallery. I'm also apart of a blog hop tonight. My color theme is black and white. My inspiration come from my art projects from my Arts as Healing classes. 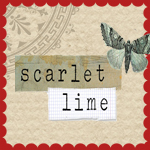 The blog hop is hosted by Lisa James, free spirit productions.